President Donald Trump celebrated his new trade deal with Canada and Mexico on Monday, as a new survey shows some of America’s neighbors rank him among the lowest in their views of the president’s leadership. Canada and Mexico were among 25 countries polled by the Pew Research Center for a new survey released on Monday that found international opinion of the Trump administration and the United States remains low during Trump’s first two years in office. Most of the polls were conducted between May and July. Mexico had the lowest ratings for the Trump presidency with just 6 percent expressing confidence in his leadership. Canada’s ratings of Trump’s leadership were higher at 25 percent, while only 39 percent of Canadians expressed a favorable opinion of the U.S. as a whole — the lowest percentage since Pew began polling Canada in 2002, the study said. President Donald Trump meets with Canadian Prime Minister Justin Trudeau during the G-7 summit, June 8, 2018, in Charlevoix, Canada. Worldwide confidence in Trump remained low at 27 percent, up from 22 percent in 2017 when 37 total countries were surveyed. The numbers were still significantly lower in comparison to the 64 percent favorability rating in the final years of the Obama administration. 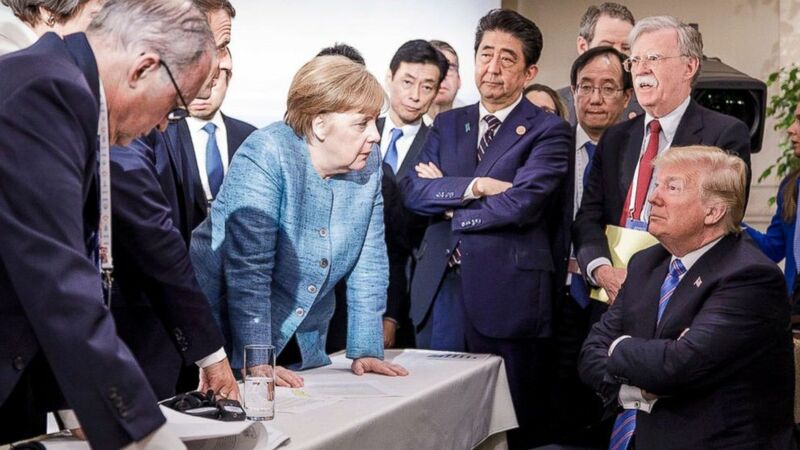 The low ratings come just one week after an awkward moment at the United Nations General Assembly in New York in which world leaders laughed audibly after Trump touted his administration’s accomplishments. The president later said leaders were laughing with him, not at him, but the reaction was an unprecedented occurrence at an event that is typically marked with stoicism. Two of America’s closest European allies reported low confidence in Trump. In Germany, just 10 percent held a favorable opinion of the president, while three-in-four Germans said the U.S. was doing less to address global problems. In France, Trump’s confidence rating was similarly low at just 9 percent with 81 percent saying the U.S. doesn’t consider the interests of countries like France when making foreign policy decisions. The United Kingdom held a higher confidence rating of Trump at 28 percent. 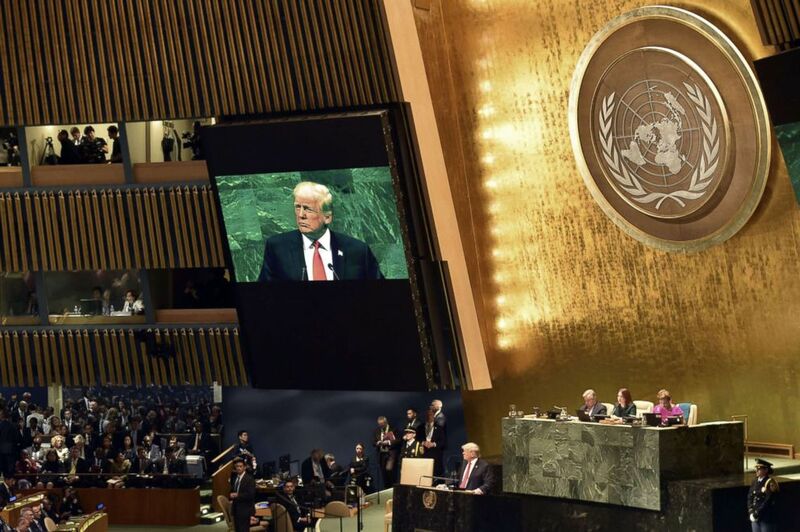 President Donald Trump speaks during the General Debate of the 73rd session of the General Assembly at the United Nations in New York, Sept. 25, 2018. The two countries with the most favorable views of the U.S. were Israel and the Philippines at 83 percent, followed by South Korea at 80 percent. The rating was unsurprising in Israel where Trump accomplished a major campaign promise in the last year to move the U.S. Embassy from Tel Aviv to Jerusalem. Sixty-nine percent of Israelis viewed Trump positively, up from 56 percent in 2017. Trump also saw a major boost in support from South Koreans who expressed 44 percent confidence in the president up from 17 percent last year. The Korean Peninsula has been a strong focus of the Trump administration with the president holding a historic summit with North Korean leader Kim Jong Un in June and ongoing negotiations to denuclearize the peninsula and end the Korean War. The country with the least favorable view of the U.S. was Russia at 26 percent, down from 41 percent in 2017. Fifty-five percent of Russian said bilateral relations have worsened over the past year. While 53 percent of Russians expressed confidence in Trump in 2017, that number plummeted to just 19 percent this year. 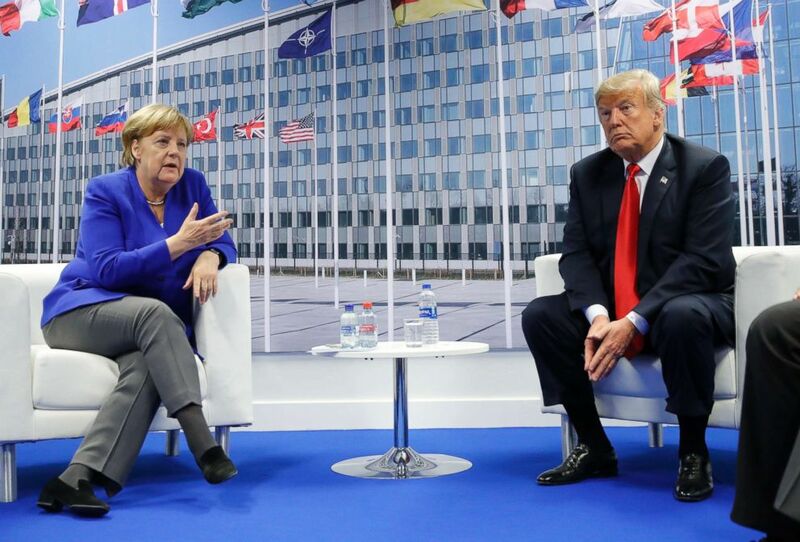 President Donald Trump and German Chancellor Angela Merkel hold a bilateral meeting, July 11, 2018 in Brussels, Belgium during the NATO summit. While Trump’s confidence rating remained low at 27 percent, other world leaders saw much more favorable ratings. Fifty-two percent expressed confidence in German Chancellor Angela Merkel, while 46 percent felt the same way for French President Emmanuel Macron. Chinese President Xi Jinping and Russian President Vladimir Putin also polled higher than Trump at 34 percent and 30 percent, respectively.